All school tours complement the Common Core Standards: K-5 and 6-12. School tours are available Tuesday through Friday. Fees for tours are $6 per person. Scholarships are available on request. To book a tour and to answer all questions, please contact Mary Ann Monley at 585.276.8974. 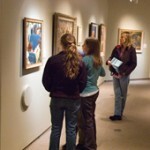 Students are welcome to visit the Gallery Store with an adult chaperone when the Gallery Store is open. Please arrange for one adult chaperone per 10 students. Self-guided tours are welcome but must be booked in advance. Tours are 60 minutes long; 45 minutes for pre-K-1st grades. Tours are led by volunteer guides called docents. One will contact you to learn about your students and expectations for the tour. If accommodations are needed for any students, please let the docent know. Requests for tours in American Sign Language, French, German, and Spanish are welcome. Additional time beyond the tour for drawing and writing exercises must be requested in advance. New tour for the 3rd and 4th grades, developed by MAG and the Rochester City School District. aspect of art history; please discuss your objectives and plans with the docent during the pre-visit call. Based on the popular book by E.L. Konigsberg. Explore a real art museum like Jamie and Claudia (but only for an hour, not for a week), view and compare artworks similar to those described (but no bathing in the fountains) and imagine being a character in the story. This tour is particularly appropriate as a culminating activity for a class reading project. 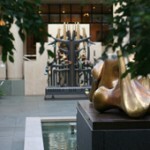 Henry Moore’s Working Model for Three Piece No. 3: Vertebrae (foreground) is one of the stops on this tour. Follow the stories of upstate New York, Rochester, and the Memorial Art Gallery itself through artworks in the Gallery’s collections. Portraits, landscapes and decorative objects all provide a glimpse into aspects of American life in the 18th and 19th centuries. What is an art museum? What can you learn by looking at an artwork? Students of all ages explore the Gallery’s collections through finding details, learning new vocabulary and sharing their own observations. Travel through time and space and hone observational skills on a cross-cultural world tour. Come face-to-face with artworks such as masks, paintings and statues representing cultures from major world regions, including the Arctic, Central and South America, Europe, Asia, ancient Egypt and sub-Saharan Africa. Explore universal themes of civilization such as writing, religion and burial customs by examining the Gallery’s collections from the ancient Near East, Egypt, East Asia, Greece, Rome and Medieval and Renaissance Europe. Experience the thrill of interpreting and comparing real artworks and artifacts 500 to 5,000 years old. “Listen” to artworks with a story to tell, “hear” how culture influences art and “see” how beliefs and stories pass down through narrative and symbolic art. Compare and contrast ancient beliefs and living traditions from diverse cultures, including medieval Europe, ancient Egypt, traditional Africa, Buddhist Asia and the indigenous Americas. Broaden your students’ vision, as well as your own, through tours of special exhibits drawn from museums around the world and from MAG’s own collections. Preview current & upcoming exhibitions and then contact Mary Ann Monley at 585.276.8974 to schedule a tour.